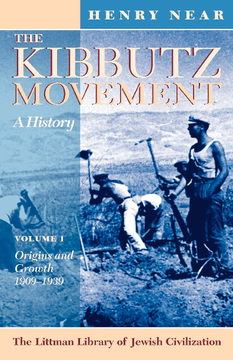 The two volumes of this work comprise the first comprehensive history of the kibbutz movement in any language. Origins and Growth covers the first thirty years of this fascinating story, from the formation of the kibbutz in the opening years of the twentieth century to the eve of the Second World War. It is a masterly analysis of the genesis and expansion of the kibbutzim and their relations with the world around them. It considers not only the various components of the kibbutz movement but also the pioneering youth movements from which their members came. Henry Near’s analysis of the ideological, political, economic, and social development of the kibbutz movement is illustrated throughout by excerpts from historical sources, affording a wealth of colourful insights into the changing quality of kibbutz life as experienced by its members. The second volume, Crisis and Achievement, 1939-1995 extends the detailed historical analysis to 1977 and gives a comprehensive overview of subsequent developments.